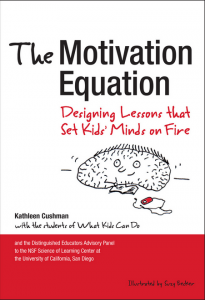 The upcoming new ibook by Kathleen Cushman, “The Motivation Equation,” stands to expand on her pioneering work in leveraging students’ voices in shaping learning environments, pedagogical practices, and transforming how we talk about learning. And thank goodness. Often missing from our education discourse is, ironically, the most important element of our education system: the learners. Kathleen’s synthesis of the essential mind, brain and education science related to motivation into 8 steps or conditions is mind-bogglingly clear. More importantly, the 8 steps are readily accessible and practical. The Motivation Equation is rich with student voices – offering a “unique ‘trialogue’ among students, teachers, and learning scientists” – which anchor the steps and the research in familiar realities. The Motivation Equation is the best (ever) use of the e-book medium that I have seen to date. Unerring integration of sound and video clips, call-out boxes for brief bios and research notes, links to additional resources, survey templates, and protocols for engaging learners in exploring their own motivation represent a treasure trove of value-added resources. Still need convincing to check it out? Visit WKCD‘s new website, How Youth Learn, for research highlights and videos of student voices. If you ever have a chance to meet Angela Maier, you’ll know who she is immediately.While probably not the tallest person in the room, in a hall of 5,000 she may well be the most energetic. A former teacher turned consultant, author of two books, including “Classroom Habitudes” and now Chief Instigator, Angela has amassed a global, passionate network at the intersection of her enthusiasm, belief in each and every person, and unsinkable optimism. Beginning with a TEDx Des Moines Talk, she launched her #YouMatter campaign, an effort to instill in others the simple idea that, well, they matter. Through her partnership with the International Dot Day, which ended up bringing together over 800,000 students from around the world, she recognized the demand for providing young people a way to turn their ideas for making the world a better place into a reality. The Choose 2 Matter movement is an answer to that demand. As described on the Choose2Matter website . . .
CHOOSE2MATTER – a crowd sourced, social good community where world changers can create their own “Dream Team” to pursue solutions to global problems. With her signature enthusiasm and network-ability, Angela has brought together a team of partners and visionaries to launch the “Quest 2 Matter,” which the Choose 2 Matter website describes as . . .
To take action to change our world. Students choose a quest that matters to them. They register at one of Choose 2 Matters’ partners’ sites. Students tell their story in a media of their choosing. Or, students can share their story via email or via another other social media site. Students have until May 31, 2013 to submit their quest if they want a chance to be recognized / highlighted at the 2013 Bammy Awards. However, Quests are on-going and the team is already hard at work to find new ways of honoring future submissions. This is an important effort that seeks to simultaneously raise the volume on student voice, student impact, and how people view the current and future capacity of all students. Additionally, it communicates to students that not only do they matter and that their vision and action are valued, but also that they have power now to enact positive change in the world. No need to wait until they are in their college or career. The future they want for tomorrow begins with their effort today. Nice work, Angela. We at QED support you. Want to be more involved in the Choose 2 Matter movement? You can “like” them on facebook, follow them on twitter, or contact the team via their website. In a recent post at KQED/Mindshift, Tina Barseghian reports on the work of Michael Mills, a professor of Teaching and Learning at the University of Central Arkansas, who advocates for closing the digital divide between high and low income students. He argues that increasing access to digital devices can play a role in empowering low income students by opening pathways to information and social media, and by proxy, achievement. Ms. Barseghian cites a recent study reported at Mashable that demonstrated a 30% increase in test scores for low income students who were allowed to use mobile devices for learning and collaborating. Access is a basic right. It’s the same as roads or clean water or electricity. Those are [accessible] here in this country because we expect it. The same thing should apply to the Internet. The Internet is about empowerment. If we take away this access because we think certain people aren’t going to use it right, we’re no better than governments who take away voting rights from minorities. Ms. Barseghian goes on to provide a list of 11 ways that Dr. Mills suggests educators can work to narrow the divide. For educators who want to start chipping away at the divide, Mills listed a number of ways. Many Title 1 schools — those in low-income communities — receive funds and grants, but don’t always buy what they need. If they have enough funds, Mills said schools should invest in a 1-1 program — a device for every student. Educators should also be instrumental in guiding student etiquette with devices. For students who use text-speak and shorthand when handing in assignments, teachers can ask them to proofread and resend until the assignments are up to par. “We can teach them to use mobile literacy to help themselves,” he said. “We need to think about what we are teaching,” Mills said. “This is not technology — this is Pedagogy 101.” Educators must understand the dotted line between an assigned activity and the instructional objective, which should be tied to learning skills. Just giving kids a number where they can reach you has “exponential impact,” Mills said. “Just that small gesture tells kids you’re available.” For those who don’t feel comfortable giving students their phone numbers, Mills suggests using a Google voice account, which students can call and leave messages. 5. INVITE OBSERVERS TO YOUR MOBILE ENHANCED CLASS. Parents, other teachers, and administrators will learn a lot from watching how kids can plug into learning by using their devices. During their visits, talk about the upward trajectory of kids you’ve noticed who have benefited from the change. Keep track of who owns what kind of device (especially after the holidays when kids receive new ones). This way, you can create flexible, shifting groups to make sure there’s a good variety of devices in every group. Don’t place all the iPhone 5 users in one group — mix them up to promote equity. Be careful not to publicly call out kids who don’t have a device when organizing groups. Use common sense and compassion. 8. USE EVERYTHING YOU HAVE. If the school has 10 Kindles, find ways to use them in your class. If it has six iPods or 30 computers, don’t let them collect dust. Even the oldest computers can be fired up for basic research. Sitting quietly doesn’t exemplify productivity, Mills said. If you have flexible processes, you can give students different ways of understanding. 10. TEACH PROCESS NOT CONTENT. All educators, but especially those who teach low-income students, need to be open to students’ ideas of showing what they’ve learned. If they don’t want to write a blog, but want to create a video, be open to it. Promote group work and project based learning. While these can make a difference at a classroom and school level, what can we do on a larger societal level to change the game for low income students when it comes to digital access and technological empowerment? A Landscape of Stumbling Blocks or Stepping Stones?